The gold decor of the chapel alter at the Palais Lascaris in Nice, France in Europe shows the true history of this museum. Gold antique pieces of art from the early 17th and 18th centuries are displayed in the chapel alter at the Palais Lascaris Museum in the Old Town of Nice in France, Europe. Even the walls and architecture of this famous museum are done in a gold color to blend in with the rest of the furnishings. Tours are available to see this historic chapel in the Palais Lascaris Museum in Nice, France as well as the many other rooms throughout this palace.Chapel Alter in the Palais Lascaris, Museum, Old Town, Nice, Provence, Cote d'Azur, France, Europe. 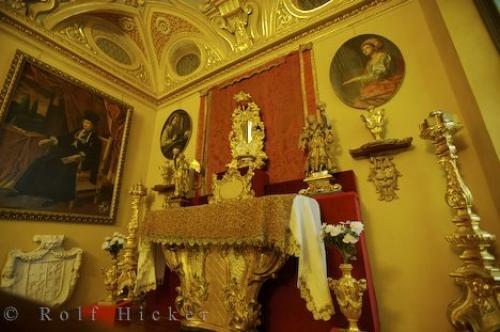 Photo of the gold decor of the chapel alter at the museum in Nice, France.